Inspiration for me comes in many different forms and images. The most recent was actually from a Scooby-Doo movie. The movie was called Scooby Doo and the Goblin King. My daughter was watching it part of mother's day. It wasn't a super great movie but that's not the point. The point is I became inspired by the skirt a fairy in the film was wearing. It was a knee length flared skirt with triangular godets. I really liked the shape and the simplicity of the design and immediately saw several variations I could make using material I have. The most recent problem I have come across is that I don't have enough of one single type of fabric to make a dress or skirt. So any clothing I make needs to incorporate at least two fabrics to create a single piece. This has previously prevented me from making things I wished to make. So, this skirt really was a great find, albeit found from a cartoon. So, with my silly inspiration at hand I have set out to draw out my ideas on paper. Usually I use a copy of a fashion spec template to do this because it's the most direct, reasonable way in my mind. Unfortunately I did not have a copy pulled out and set aside for when I left this morning so I had to find a substitute. THIS is what I found. In case you are not familiar with a fashion spec let me shed a little light on it. A flat pattern spec, or specification, is the technical drawing used by manufacturers to make a garment. When a company sends out the info of their design to a shop to be created this image is used as a reference. It gives a guideline of the length and proportions wanted in the finished design, the seaming and even details of the stitching. I find this most useful for when I am sketching out an idea of what I want to make. 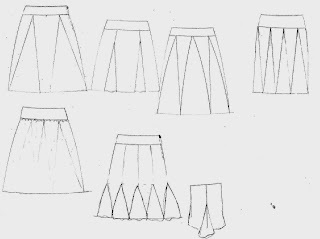 My next step to a real skirt was taking my inspiration and drawing out my ideas. 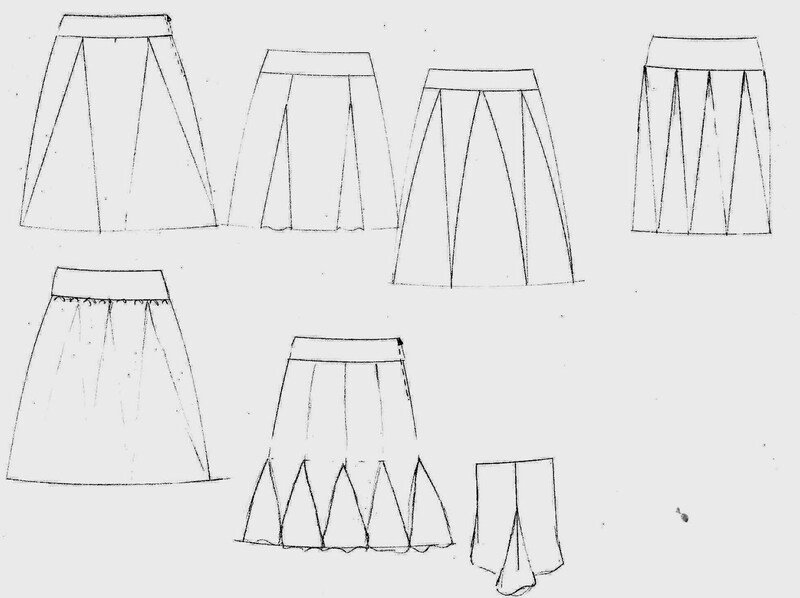 I laid a piece of thin copy paper over top of my printed spec and drew a few skirt variations. Sadly, my sketches are very light as they are done in pencil and not micron pen but I think you get the idea. I am leaning towards that bottom A-line skirt option with the triangular godets. It's very similar to the inspiration but with a drop waist and princess seaming. I am also liking a pencil skirt idea (not pictured) that would have similar lines as that A-line skirt. Or that gathered option that came out very poorly on the scan. The others remind me too much of cheerleaders. Hmmmmm. I will ponder this for a bit while I work on finishing up a crochet plarn clutch.